George IV (George Augustus Frederick; 12 August 1762 – 26 Juin 1830) wis Keeng o the Unitit Kinrick o Great Breetain an Ireland an o Hanover follaein the daith o his faither, George III, on 29 Januar 1820, till his ain daith ten years later. Frae 1811 till his accession, he served as Prince Regent in his faither's feenal mental illness. 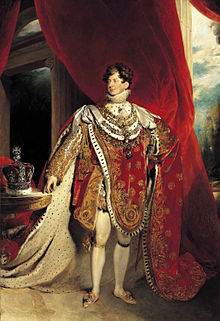 George IV led an extravagant lifestyle that contreibutit tae the fashions o the Regency era. He wis a patron o new forms o leisur, style an taste. He commissioned John Nash tae big the Ryal Pavilion in Brighton an remodel Buckingham Palace, an Sir Jeffry Wyattville tae rebig Windsor Castle. His chairm an cultur earned him the teetle "the first gentleman o Ingland", but his puir relationship wi baith his faither an his wife, Caroline o Brunswick, an his dissolute wey o life, earned him the contempt o the fowk an dimmed the prestige o the monarchy. He forbade Caroline tae attend his coronation an asked the govrenment tae introduce the unpopular Pains and Penalties Bill in a desperate, unsuccessfu attempt tae divorce her. For maest o George's regency an ring, Laird Liverpuil controlled the govrenment as Prime Meenister, wi little help frae George. His meenisters foond his behaviour selly, unreliable an irresponsible. At aw times he wis muckle unner the influence o favourites. Taxpayers war angry at his wastefu spendin in the Napoleonic Wars. He did nae provide naitional leadership in time o creesis, nor act as a role model for his fowk. Liverpuil's govrenment presidit ower Breetain's ultimate veectory, negotiatit the peace settlement, an attemptit tae deal wi the social an economic malaise that follaed. Efter Liverpuil's retirement, George wis forced tae accept Catholic emancipation despite opposin it. His anly legitimate child, Princess Charlotte, dee'd afore him in 1817 an sae he wis succeedit bi his younger brither, William. This page wis last eeditit on 8 Februar 2018, at 22:50.